Hermann Uhl’s RPM 68 is my top choice for reed profiling. The construction and precise machining of this profiler is incredible and it’s capable of making exact copies that are accurate to within 0.01 of a millimeter. It copies cane reeds or premade plastic guides which are modeled after many commercial vamps. Hermann Uhl can also produce a plastic guide to custom dimensions. 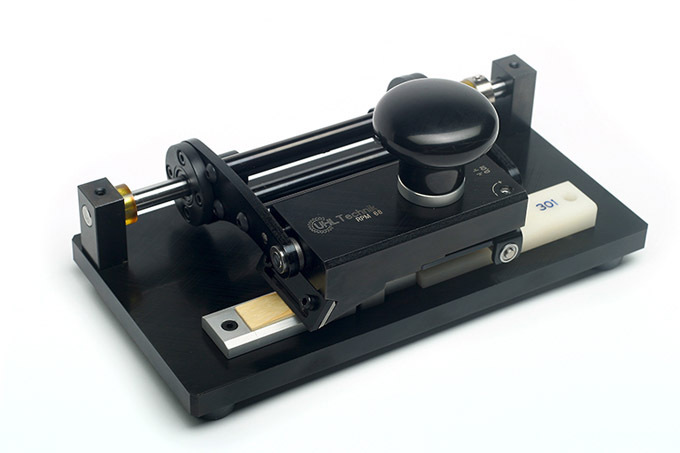 The RPM68 is easily adjustable, cuts with no pressure and creates accurate copies with almost no learning curve. See the RPM 68 Primer for more info. This profiler by Hermann Uhl is exactly the same as the RPM 68 but slightly larger to accommodate bass clarinet and saxophone reeds. The Reedual seems to have gained the most popularity in the US. As far as reed profilers go, the reedual is quite cheap in price. The reedual can produced fine reeds however it has many idiosyncrasies and is not machined to a high enough tolerance to produce copies that are accurate to within 0.01mm. In most cases when using the reedual, the model reed needs to reverse engineered or modified a bit to compensate for the idiosyncrasies of the machine. Copying the tip area is problematic on the reedual. This sudden drop off around the arc of the tip on the model reed creates problems for the tip of the new reed. One workaround that I have found works well is to cut the tip off and place a post-it note of equivalent thickness in it’s place. The Reedual requires some skill as the pressure with which you cut can greatly affect the resulting reed. The quick deterioration of the sandpaper also adversely affect consistency. For best results change the paper for each reed. The Reed Machine by Robert Dilutis can also be used to make fine reeds but like the Reedual it not machined to exacting tolerances. It is made of aluminum which is a strong light metal, but not as strong as steel and thus the machine requires a fine touch as excess pressure can have an adverse effect on the reed. The Dilutis Reed Machine does not work well copying cane reeds as a model, the action of making a reed tends to destroy the model reed before the blank is finished. It works best with his steel guide. Robert Dilutis recommends that you soak the blank thoroughly before profiling it. This makes the cutting easier and improves the final result however, I would imagine that some warping may occur during this process. Greg James has a profiler that is more commonly used by Bassoonists but he makes a variation that copies clarinet reeds. The cutter is a drill bit. It has adjustment guides on every axis to ensure all the parts are parallel. Greg James can also retrofit the Reedual with similar adjustment guides to improve it’s accuracy. I have not tested this machine. 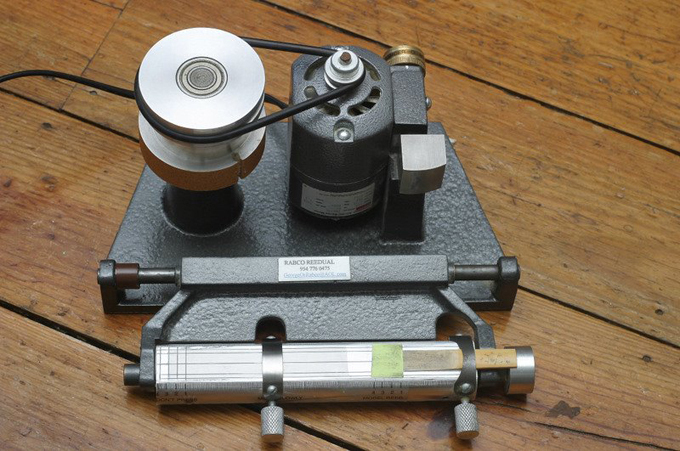 The Reeds ‘n Stuff profiler operates in almost exactly the same way the RPM 68 does. It appears to use a metal guide as a model. The cutting arm only slides back and forth. If you’ll notice the angle of the vamp is created by rotating the plate that the model and blank rests on and the cutting arm does not rotate. I have not tested this machine. 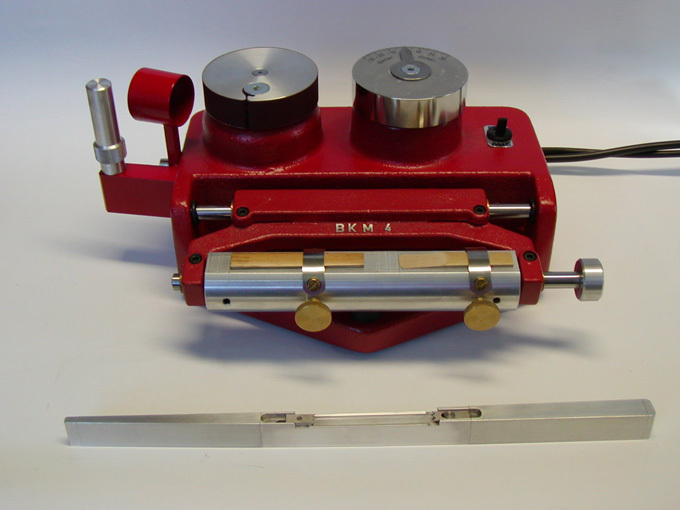 The BKM 4 operates on the same principles as the Reedual. It is made in Germany. It is said to have a more powerful motor and is more accurate than the Reedual. Based on this picture you can see some design improvements over the Reedual. The method of installing sandpaper is more elegant. There is a ring where you can easily attach a vacuum head to take care of the dust. Thickness control looks much more accurate and refined compared to the Reedual. I have not tested this machine.